The map below will be updated throughout the 2016 April Storm to share information on active emergency operations centers, shelters, and other information that will be helpful to people impacted by this weather system. 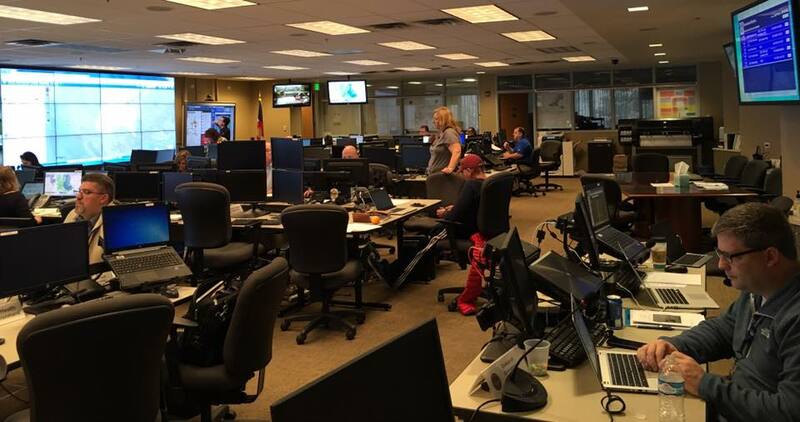 The State EOC is currently virtually activated to coordinate resources and support local jurisdictions impacted by the statewide weather system. April 16, 2016 Update 5 p.m.
State EOC virtually activated at Level III at 6 p.m. and will continue virtual support on Sunday, April 17, 2016. No requests for state assistance. All local emergency operations centers (EOCs) transitioning to virtual activations. Shelter in Falcon has been closed. April 16, 2016 Update 8 a.m.
State EOC activated at Level II. Governor has authorized the Colorado National Guard to respond if requested by local jurisdiction. 9 local emergency operations centers (EOCs) activated. Numerous other local EOCs virtually activated or monitoring. 1 shelter open in Falcon.